Buy online in India U30D40C Fast Ultrafast Diode at low cost from DNA Technology. Mounting Torque: 11.5 cm-kg (10 in-lbs) Max. 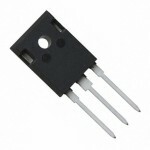 U30D60C Ultra Fast Recovery RectifierU30D60C is the 30.0 Ampere Dual Common Cathode Ultra Fast Recov..
U30D20C Ultra-fast DiodeU30D20C is a 30 Ampere dual common cathode ultra fast recovery rectifiers.Fe..